Lenovo has undoubtedly made a significant impact on the business laptop segment by launching the ThinkPad T470. It comes with brilliant battery life and packed with an epic performance which surely makes it a value for money investment. 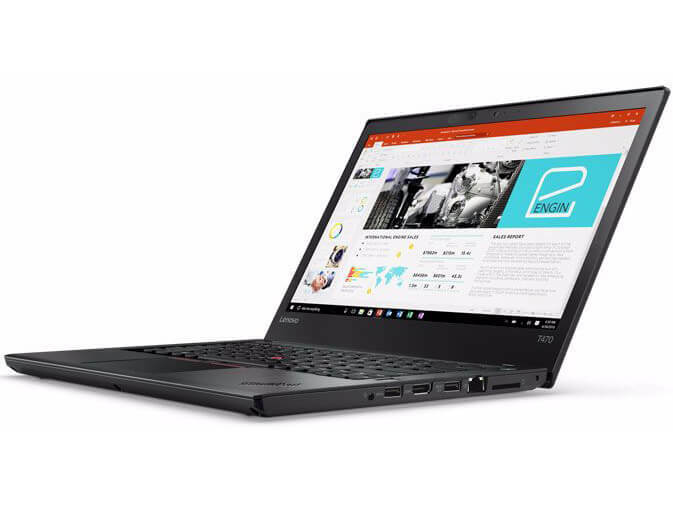 If you are looking for a laptop that can handle all your business work at an affordable price, then the Lenovo ThinkPad T470 is the best option. Personal computers have undoubtedly changed the way we work and manage our daily chores. With the invention of laptops, people started to travel freely without any worries of finding a cyber cafe and sit inside a cabin to use a desktop. If you are looking to buy a new laptop for business purposes, then there are several options available. Lenovo ThinkPad T470 is one of the top contenders in the market. Laptops have allowed us to go anywhere we want to and still carry out all our necessary work. Not only that, laptops provide us with a portable source of entertainment and support for our internet needs as well. Over the years, laptops have evolved and have become very sophisticated with brand new technologies and software integrations. The Lenovo ThinkPad T470 comes with some exciting features and brilliant build quality which makes it an eye-catcher. Regardless of which business you run, you can benefit a lot from this laptop and carry on with your vital tasks. Before we move to the Lenovo ThinkPad T470 Review, we will provide you with a quick glance at its pros and cons. The Lenovo ThinkPad T470 is a power packed laptop that comes with some brilliant features. It is an almost 14-inches screen size laptop with a good body structure. The design is sleek and has a very promising build quality. The six-cell battery is efficient enough to get you going throughout the day. However, the low sound quality and the less vibrant screen can take a point off from the total ratings. In spite of that, it manages to be one of the best performing laptops in the market. The ThinkPad T470 comes with a familiar laptop design but has a contemporary finish which looks premium and stunning. It runs on the Intel Core i5-7200U and coupled with a DDR4 RAM sets the bar high in terms of performance. The Lenovo ThinkPad T470 is launched at a more or less affordable rate of $783 for the base variant. However, you can pay more and get the top model at $1383 which comes with significant upgrades. The top variant comes with a more efficient 16GB of RAM, Anti-Glare screen and a speedy PCIe-based 256GB SSD. You also get the latest OS – the Windows 10 Pro. The battery performance gets with the top variant is brilliant and makes sure that you do not run out of charge frequently. The Back-lit keyboard and processor comes as the same in both the variants of the ThinkPad T470. 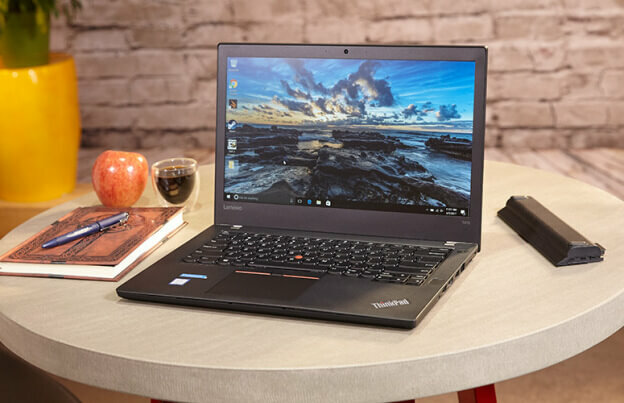 The Lenovo ThinkPad T470 is 13.25 inches in length and 9.15 inches in height which is noticeably less than its previous version which was 0.83 inches thicker. 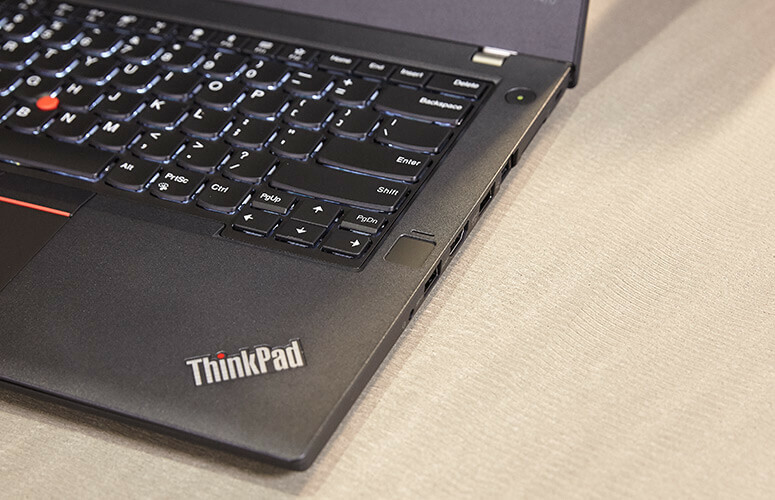 It comes with a classic rectangular and black aesthetics of the ThinkPad lineup. However, there is a small surprise for the users. It is not very heavy, and thus, you can easily carry it in your bag and weighs just 3.4 pounds. The laptop has a new stylish makeover as Lenovo has added a much darker shade of black which looks stunning from wherever you look at it. The glass over the monitor is made up of glass-fiber-reinforced plastic which makes it more durable and saves from the accidents that can happen during traveling. 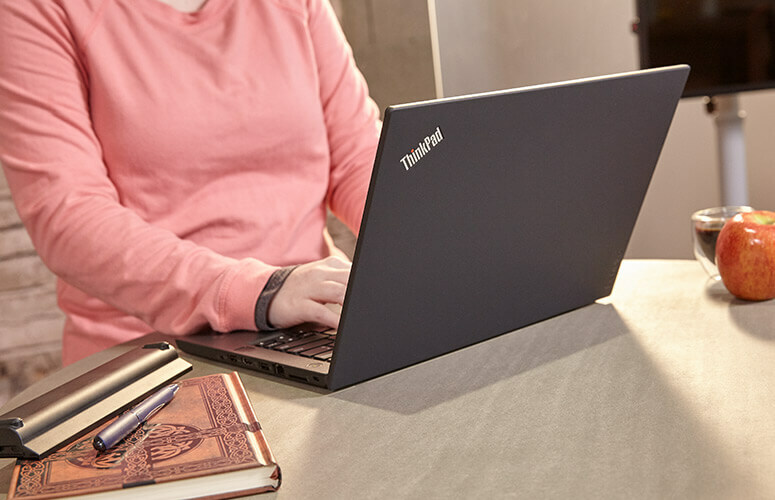 The laptop body has a smooth and premium finish that truly justifies the price of both the variants of ThinkPad T470 and helps to amplify the overall looks. The Lenovo ThinkPad T470 has been integrated with some impressive hardware features. It comes with 1920 x 1080 non-touch display which provides crystal clear and subtle screen quality, but there is surely a lack of color vibrancy and brightness. Even though the screen may seem to be a bit dull to many people, it still manages to give satisfactory results. The laptop is powered by an Intel Core i5-7200U CPU, 8GB/16GB of RAM and 256GB PCIe SSD. The i5-7200U is a great processor to do multitasking and run your daily business applications. It has a good benchmark score and allows the laptop to outperform many of the mid-segment laptops in the market. The 256GB PCIe SSD allows the system to carry out seamless multitasking very quickly without any noticeable lag. The Lenovo ThinkPad T470 is a solely business laptop and that is powered by the integration of Intel HD Graphics 620 GPU. If you want to play high-end games on Ultra settings with the best GPU benchmarks, then this is not the one for you. However, it can still run games at decent graphics and FPS. Coming to the keyboard, the Lenovo ThinkPad T470 houses an impressive keyboard which illuminates enough light to help you see the key markings clearly in the dark. The Back-lit keyboard is also convenient to use and has a comfortable posture design. The keys have a deep 2mm of vertical travel that allows you to type faster than your average and does not causes discomfort to the wrists as well. There is also a 3.9 x 2.7-inch Touchpad which functions brilliantly and is very much responsive. So you can type and surf through your business reports and charts without much hectic and stress. Often people are anxious about the availability of connectivity options in a laptop. However, the Lenovo ThinkPad T470 comes with a wide range of connectivity features. It comes with a Thunderbolt 3 port which allows you to use any USB 2.0 and USB Type-C hard drives without any issues. It also houses a PowerGear USB-C charger which worked flawlessly. On the right-hand side of the laptop, you get two USB 3.0 ports, a 3.5mm audio jack, HDMI port, full-size Ethernet port, Kensington lock slot and also a slot for the SD card reader. On the left side, you can see the Thunderbolt 3 port, a USB 3.0 port, and the flat power connector. A 720p webcam is also available with the laptop which has a dual microphone for clear audio quality. The quality of the webcam is also brilliant, and you will be surprised to see the results as there is no drop in the quality of pictures and video that is recorded. So you can see that, there is indeed not much reason to be upset or disappointed about the various connectivity features provided in this laptop. The Lenovo ThinkPad T470 specifications seem to be right on paper, and it performs decently well in real-world conditions as well. Even though this is not the most powerful laptop we have seen so far this year, it will surely help you to get the efficiency and speed you need to quickly carry out your daily chores without any hassles or wait period. The Intel Core i5-7200U CPU and 8GB/16GB of RAM are more than enough to run heavy applications like Adobe Photoshop or Coral Studio. It can flawlessly allow Word and Excel programs to run on the laptop. The system is backed by a versatile and long-lasting six-cell removable battery provides a runtime of 17 hours and 39 minutes! That’s incredible in every sense! Even the much expensive Apple MacBook Pro provides 16 hours of run time when compared to Lenovo ThinkPad T470. So that’s one of the biggest highlights of the performance. You can watch movies, videos, presentations, do multitasking and still be left with a bit of charge after 14-15 hours of non-stop usage. However, the screen quality performed not in the best fashion because the colors and brightness could have been revamped a bit more than what it shows. The Intel HD Graphics 620 GPU, as we mentioned before is not the GPU you would want for gaming purposes, but it surely supports many games you want to play with a decent performance. Casual gaming can be quickly done on the Lenovo ThinkPad T470 without much stutter. The Lenovo ThinkPad T470 review gives an idea on how it makes a perfect laptop among all others which we have seen in the market. However, it inevitably arrives with plenty of features to be excited about. The long-lasting battery life, comfortable keyboard, good processor and RAM management along with a plethora of connectivity features make it one of the best business laptops available in the market in 2019.